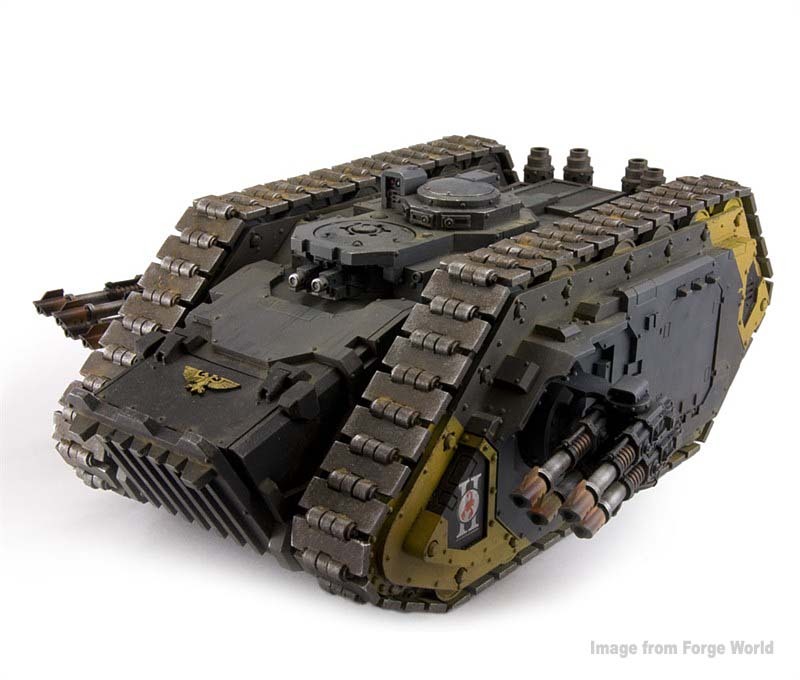 With Forge World releasing their new take on the famous Spartan Land Raider, I thought I might take a look at the old one, Forge World's new version and my favorite, the good old Proteus. UPDATED: Here are the FW Experimental rules for this monster! 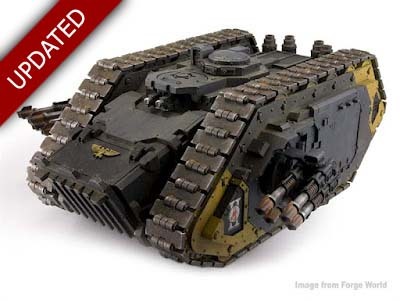 The Spartan was a Land Raider variant designed during the Horus Heresy to carry a full squad of Terminator-armored Marines through the 'Ring of Death' surrounding the city of Aries Primus on Mars. The standard Land Raider at the time could not transport Terminators. The original Spartan had the standard Land Raider armament of the day, two twin-linked lascannons (heavy bolters were not standard then) but also mounted either a heavy bolter or heavy flamer on a turret on top. It was widely spread after the Heresy, but disappeared when the standard Land Raider was re-designed to carry Terminators. The Spartan design used today features the twin hull-mounted heavy bolters seen on contemporary Land Raider designs, as well as a pair of sponsons fitted with a quad-lascannon battery each. It is able to transport a much larger number of Space Marines in power armour. Additionally, it is considerably faster than other Land Raider variants despite its increased size, due to its reactor-driven motive drive systems. It is unknown whether this is intended to be a different pattern to the original Spartan, or whether it has replaced it entirely in canon. Very cool stuff. After getting the FW email, the one picture that really jumped out to me was this one below. The size comparison between a Spartan and a Proteus. This thing is substantially bigger than it's predecessor. That's not a bad thing either. But I still don't know how I feel about the extended nose. Sometimes it looks cool and sometimes it looks funny to me. I like that they kept it similar to the old school version, but it's not enough for me to go out and buy this monster. Truthfully, I don't think I play games big enough to warrant buying and putting this into my force. 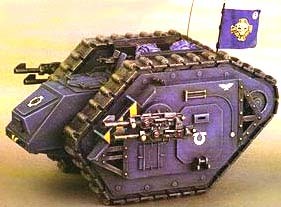 If someone wanted to use a regular Land Raider in place of this for a game, I wouldn't have any problems with that either. All in all, I'm going to say cool looking depending on how you look at her, but not something I'm going to buy. I think for me, it's the Proteus that I'm sticking with. I've started converting a regular Land Raider chassis to look like the older version. I've got some additional bits on the way for the side sponsons as I plan on magnetizing them so I have all the options. Mine's not really even a Proteus when you get down to it either. 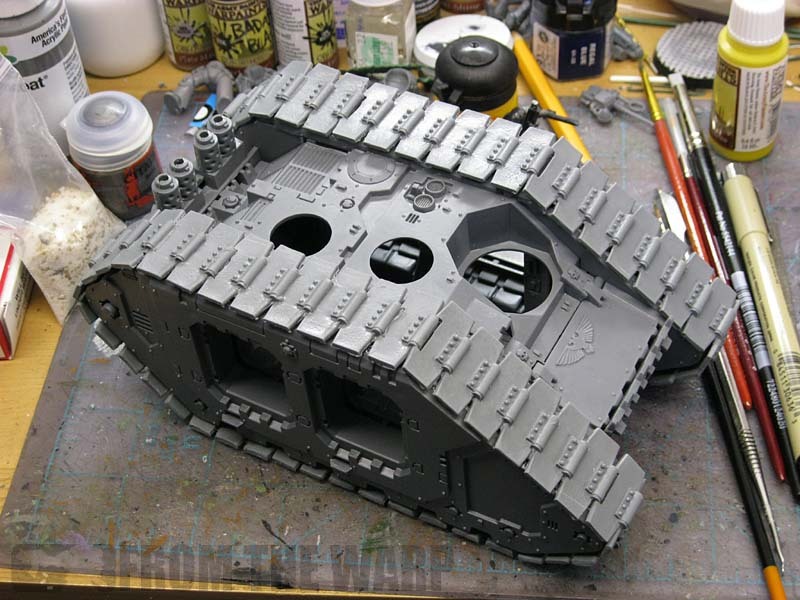 It'll be more like an older version of a MIIB Land Raider with exposed treads instead of covered ones. I think I shall call it a MKIIA. That way I'm safe with converting it into something I want and I can make up my background for it as I see fit. I'm building it for two reasons, first to see if it can be done without a tremendous amount of work (so far so good) and second, for looks and the coolness factor more than anything else. Rest assured, I'll be posting the whole tutorial on how to do this conversion once I get it done. I just need the rest of my bits to arrive first. Of course the question remains, can I make a conversion kit so that I could transform my regular land raider into a Spartan if the need arose? Maybe a little plasticard, some new doors for the front and a few magnets... interesting. I think it's a bit silly that it's better in every way than a regular Raider - better armament, greater transport capacity, *and* faster? Come on, if that was the case, why would anyone bother building the regular ones? Surely there are limitations on the design somewhere along the line. kadeton: You know, you bring up a really good point. Why even field the older versions then. I never thought of that. I'm excited to see what the experimental rules say for this thing when they do go up. Love your MkIIA! The treads look great, what did you use for those? Hudson: They are third party bits. I bought them ages ago and they've been sitting patiently under my desk. To answer your question though, I got them off eBay, but I don't remember the name off the top of my head. I'll have to look at my receipt. To answer the question raised by Kadeton-Its the same as why they stopped building Stormbirds towards the end of the Great Crusade,Thunderhawks were quicker and easier to build and required fewer materials.So the same goes with the Spartan and the Land Raider.And thats without delving into the fluff too deeply. 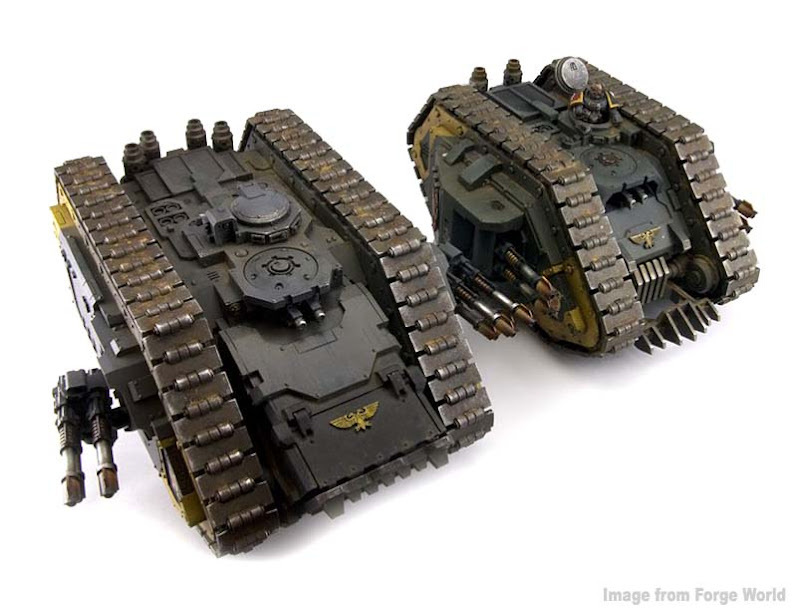 And The reason why I would include one in my Dark Angels (fluff wise) is the same as my Contemptors and soon to be built Fellblade and Stormbird,which is simply,honoured relics.And thats without going into how much of a beast it is. i really love all the heresy era forgeworld stuff but i'm already like a attention-deficit magpie in what i paint and i really, really need to resist starting a pre-heresy army. This model jumped out at me as well, I have to say I was impressed by the model, but not by the price! Hopefully your conversion will be easy and quick for those of us that want a look of something similar to it. Thanks. I'm very tempted to do something like this with my as yet un-built LR Crusader (another delay!) for my Wolves. Considering the original was a plasticard special from the pages of White Dwarf I'm surprised I've never actually seen on in the flesh in all my years involved with the game. I do like the look of this one though but it pales in comparison with the IG superheavies from FW. It's too much like a box with guns for my tastes. Fayte: No promises. It may be beyond my capabilities with plasticard. I suspect there is a way to do it, I'm just not sure exactly how it would be done yet. Ian Logsdon: Scratchbuilt one? Wow. I had some old ones a while back, but I don't know if I could build one from scratch. Robert:The IG superheavies are very cool looking. They do have some killer looking tanks. Hudson: I may drop you a line if I run into some trouble. Thanks! I like how this project is looking. I'm always interested in conversions that aren't a ton of work. Ron- You were an art major as I recall from some blog comment you made once. I'm interested to hear your opinion on the new 6e W40k cover. I think the composition is great, but something seems "off" with the proportion and perspective of the main focal character. Something about his hand holding the plasma seems small and his thighs are huge. He almost looks Liefeld-ish. Is it just me? first off the fluff issue. post heresy, everyone went a bit stupid and since the 'imperium' was founded with the emp on the throne (LOL) the mechanicum went all secretive and hoarded the STC's, meaning people did not have the stuff they used to have and innovation was frowned upon. MK IV armour is still the best suit despite the 'improvments' of MK VI and VII (all MK VIII adds is the bullet catcher gorget so not included in the list). yet MK VII is standard issue. great looking tank Ron, and you are well on the way to making a DIY proteus spartan/MKII mix. I think the proteus spartan still has the look of the older one (the assault ramp was not on the old one sadly) while combining with more modern model asthetics. if i can swing the cash i'll have to get one for my BA even if i just use it as a bog standard LR in games. Jason: It's a challenge. Most of the conversions I've seen so far are very in depth and require considerable plasticard skill to pull off. I'm trying to keep this to simply cutting away certain sections and repositioning them. As for the cover of the new book, I like it, but I know what you mean about the perspective. It's a bit forced to make him look taller, but not of the figure is treated the same way with the forced perspective. Kinda makes it a bit odd overall. I looked at the Librarian in the link you had and he looks much better, but his torso seems to be a bit too long for my liking. That's the trouble with up-scaling... there are a hundred of little things that need to be changed. cpt codpiece: Thanks. I'm going to go with the older, wide side sponsons to bulk the model out some. It looks a little narrow right now with the exposed tracks over the top. just looking at your conversion again ron, and comparing it to the FW one, the only thing that would really make it pop would be a small plasticard box/extension where the current assault ramp is, to allow the current ramp to clear the tracks. cpt codpiece: No way, I'm ordering mine. I just don't have the skill to work with plasticard like that yet. Maybe someday, but not yet. And your conversion looks stunning by the way. Thanks ron, really the work you do with greenstuff plasticard will be a doddle for you. cpt codpiece: I do better with greenstuff. My plasticard skills are getting better, but still need some work. Troels: They (the treads) are perfect for this kind of thing and they give it that old school look. Hmm... Loyalists only I suppose. Being bigger isn't always better due to being easier to target. I don't see a lot of landraiders in loyalist armies now a days. It is all about drop podding and deep striking and flying transports. Maybe 4 Hull Points will make tanks more attractive. Chaos lacking the machine spirit can now move and shoot multiple guns on their landraiders. I don't have money but if I was to splurge I think Storm Eagle adds more capability than just a bigger tank. Muskie: Very true. We'll see how flyers come into the game with the new rules. Forge World is putting out a new Aeronautica book with lots more flyers this month. They could take over tanks as the preferred transport in this edition. I saw that Chaos can field this just like the Storm Eagle. I know they clarified what takes up how much space in a transport, but I can't think of many non-Ork squads that are 25 models. I've fielded a 21 model squad in my Diseased Sons, 20 Plaguemarines plus IC and it didn't work well. Putting them all in one tank seems like the tank would be the target of every single shot, put into reserves that is 500 maybe 700 points off the table, a lot in a 1500 point battle. Given my lack of love for painting vehicles and the fact I own several other unpainted vehicles, I still think Storm Eagle might be a more survivable ie efficient way to deliver 20 models to a point on the table. You'd get style points for a looted Spartan though, that is for sure. Muskie: It certainly is all of your eggs in one basket. If someone showed up with a properly looted Spratan, I'd let them put as many models in it as they wanted... especially if it was painted up nicely.